Southland buys and sells and reconditions all makes and models of low voltage transformers. Through intensive asset recovery efforts, Southland gathers general purpose dry type distribution, drive isolation, buck boost and other types of power transformer s. We stock distribution transformer s with 600 or 480 primary voltage and 240/120 or 280/120 secondary voltages. Southland sells new and used dry type power transformer s from all major manufacturers including GE, Square D (Sorgel) Westinghouse, Cutler Hammer, ACME, Federal Pacific and others. Southland also sells new Sola Hevi-Duty power transformer and distribution transformer, uninterruptible power supplies and other power quality products. For twenty years we have supplied new surplus used reconditioned and tested transformer . Machine tool power transformer pool and spa as well as HVAC transformer 240-24V. Southland has a huge inventory of almost every type of transformer. Most transformers ship the same day and large KVA units (up to 500 KVA) are usually in stock. Customers looking for a cost effective low lead transformer can find the right dry type transformer at Southland. All of our power dry type transformer are fully tested and guaranteed. Call 800.476.1486 for all of your transformer needs. 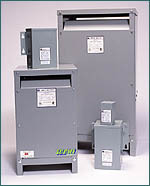 These industry workhorses feature dry type construction and are classified as isolation transformers. A high efficiency, low loss design minimizes operating costs. Designed to reduce the heating effects of harmonic currents created by solid state loads. Comply with Article 500 of the NEC for Class I, Division 2, Group D locations. Used for outdoor or designer low voltage lighting. When connected properly, these transformers can be used to raise or lower the supply voltage to match the needs of the load. Designed to handle to the mechanical stresses, voltage demands and harmonics associated with SCR applications. The units supply inrush current demands of electromagnetic loads without the secondary voltage dropping below 85% of nominal.